This volume is an account of the stage and screen practice of Australian photographer and film maker Frank Hurley, in the context of early twentieth-century mass media. Australian photographer and film maker Frank Hurley became an international celebrity through his reporting of the Mawson and Shackleton Antarctic Expeditions, the First and Second World Wars, the England-Australia air race of 1919, and his own expeditions to Papua in the 1920s. This book is an account of his stage and screen practice in the context of early twentieth-century mass media. ‘Photography, Early Cinema and Colonial Modernity’ is not a biography of Frank Hurley the man; it is instead an examination of the social life of the many marvellous and meaningful things he made as a professional photographer and film maker in the early twentieth century: the negatives, photographic prints, lantern slides, stereographs, films, diaries and newspaper articles. His stage and screen practices offer an insight into Australia’s engagement with the romance and wonder of international modernity in the early years of the twentieth century. The level of description at which this volume works is not that of personality or the originary events of Hurley’s life – the Mawson and Shackleton Antarctic Expeditions, and the First and Second World Wars – but the media events he worked so hard and so professionally to create. He called them his ‘synchronized lecture entertainments’. 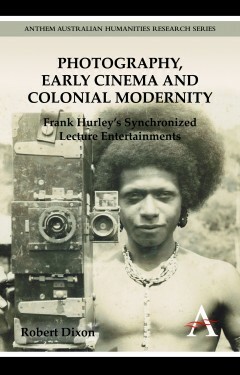 These media events were at once national and international; they involved Hurley in an entire culture industry comprising many kinds of personnel, practices and texts that were constantly in movement along global lines of travel and communication, and in a variety of institutional locations around the world. This raises complex questions both about the authorship of Hurley’s photographic and filmic texts – which were often produced and presented by other people – and about their ontology, since they were in a more or less constant state of re-assemblage in response to changing market opportunities. This unique study re-imagines, from inside the quiet and stillness of the archive, the prior social life of Hurley’s creations as they were once accelerated through the complicated topography of the early twentieth century’s rapidly internationalizing mass media landscape. As a way to conceive of that space and the social life of the people and things within it, this study uses the concept of ‘colonial modernity’. Robert Dixon is Professor of Australian Literature at the University of Sydney. He is a Fellow of the Australian Academy of the Humanities and a past-President of the Association for the Study of Australian Literature, and has published widely on Australian literature, postcolonialism, Australian cultural studies, and aspects of Australian art history, photography and early cinema.